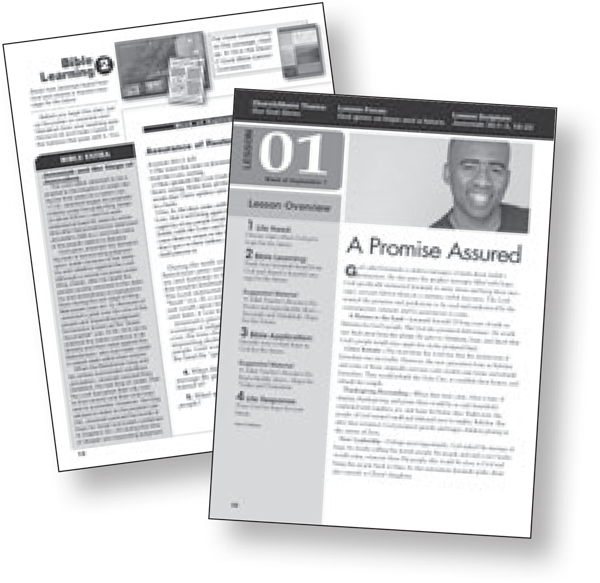 For nearly 30 years, Echoes has been one of the most widely used resources in the African-American Church, featuring culturally relevant topics and African-American imagery for today’s adults. 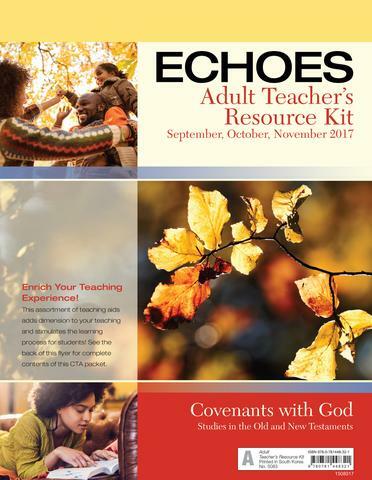 Echoes promotes community among other adults, and challenges them to continue growing spiritually, pushing them to apply every lesson to their own lives in a meaningful way. The scope and sequence of Echoes follows the Uniform Series / ISSL scope and sequence. This way, your adult Sunday school will follow the same topics as your pastor from week to week. 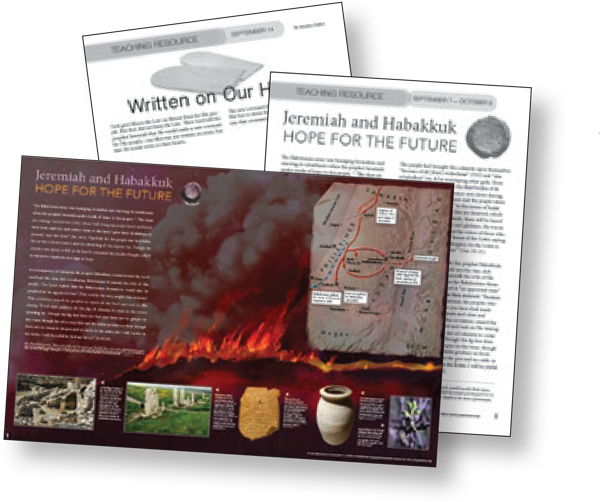 Echoes prints the NIV and KJV Scripture translation texts side by side for easy comparison. 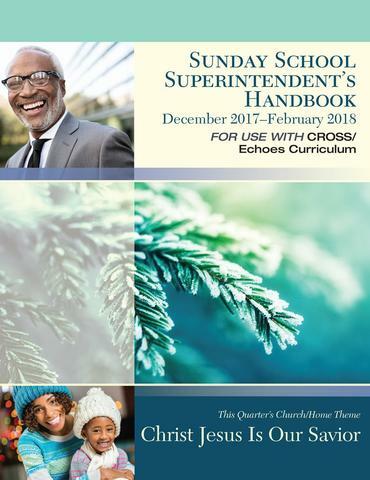 The Sunday School Superintendent’s Handbook provides multi-grade material to open and close the Sunday school hour. The handbook ensures that, while each Echoes class is age-appropriate, children, youth, and adults focus on the same Bible principle and experience biblical discipleship that connects with life. 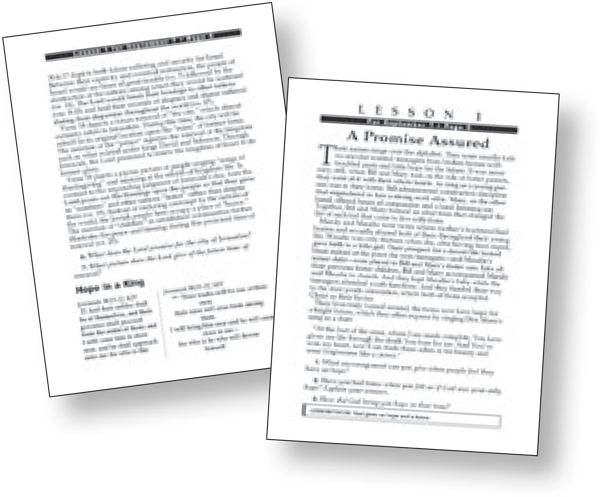 Teacher helps, suggested answers, and additional Bible commentary to accompany Comprehensive Bible Study. Also includes Highlights in Black History, introductions to each lesson, and a reduction of CBS so the teacher can follow the students easily. Order two per class, one for the teacher and another for a substitute. With posters, discussion starters, handouts, and other materials, these teaching aids will help ensure that all your students will be able to participate meaningfully. The standard in quarterly Bible study for more than 100 years, this student guide offers biblical commentary and life applications, with Scripture references in both KJV and NIV. Two editions are available to order, regular print and large print. 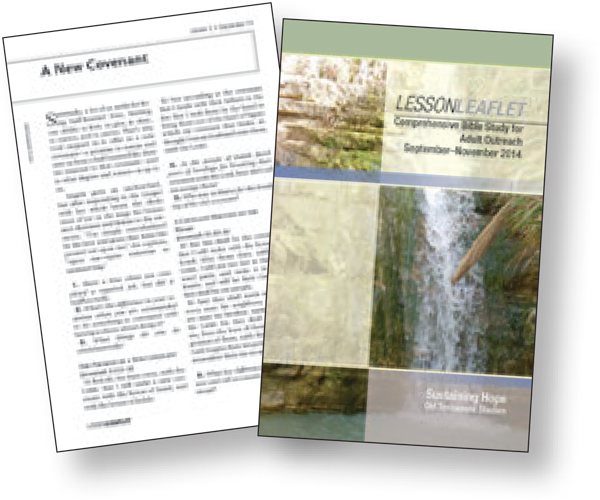 Tear-out summaries/abbreviated lessons from the student book (Comprehensive Bible Study) to be given to newcomers and visitors so they can participate fully in the class. Great for general outreach purposes beyond the class. 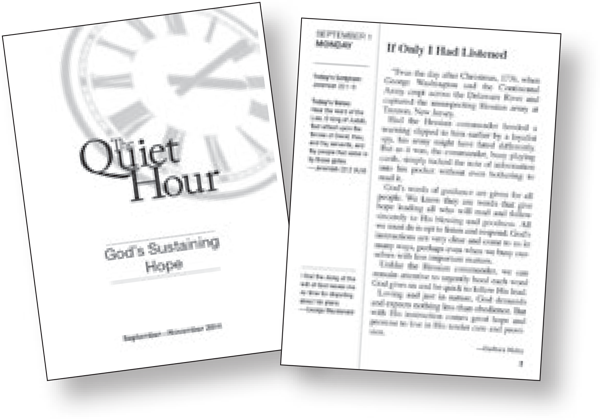 A daily devotional guide with readings that relate to the Scriptures taught in each lesson. 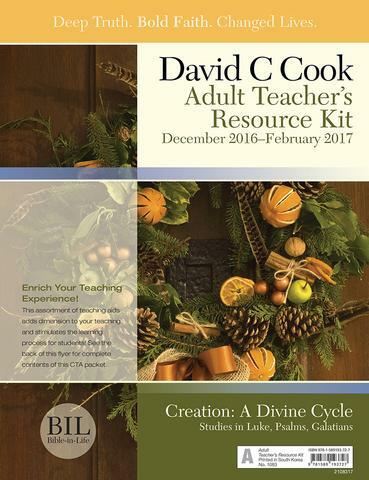 A packet containing an Adult Teacher’s Commentary and the Creative Teaching Aids, including full-color Bible background posters, handouts, and other discussion starters. 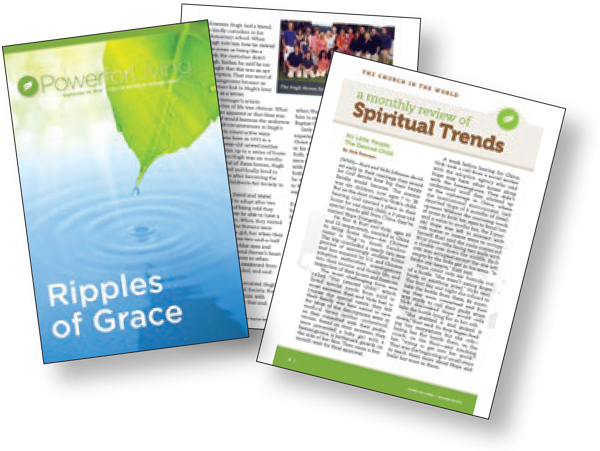 A full-color weekly take-home paper that has proven an exciting tool for both personal growth and evangelism. With life-related stories of faith, Power for Living connects God’s truth to real life. A comprehensive study of all the books of the Bible in a quarterly cycle between the Old and New Testaments. 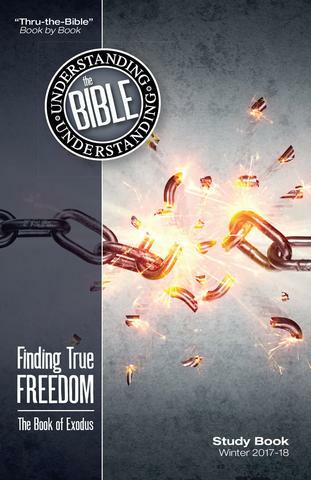 Teacher helps, activities, and life application suggestions for Understanding the Bible. Real Life Downloaded (RLD) connects each week with timeless Bible truths to timely current events. 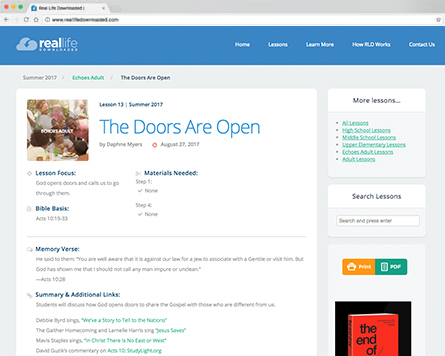 RealLifeDownloaded.com offers optional materials for Steps 1 and 4 of the week’s lesson, to provide an in-depth, current event study of the lesson materials. Download lesson samples and experience Echoes for free today! "As a Bible believing and teaching church, we have found that Echoes curriculum provides us with a better structure—enabling us to cover a range of scriptural topics in a shorter time frame."